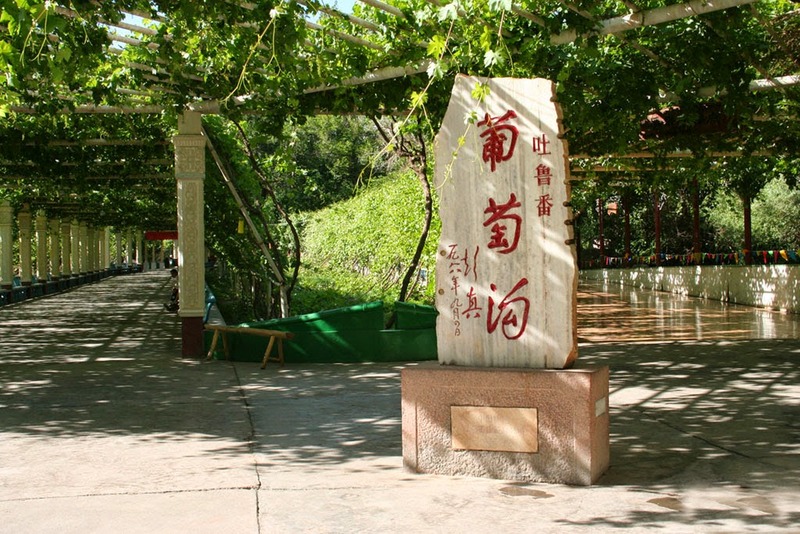 Grape Valley is situated in Turpan, under Xinjiang Province of People’s Republic of China. The valley is 8 kilometer in length and 600 to 2000 meters width and from here it is about 10 kilometers to Turpan city center. This area is famous for Grape cultivation and other fruits. The arid land and weather conditions are extremely good for grape cultivation. 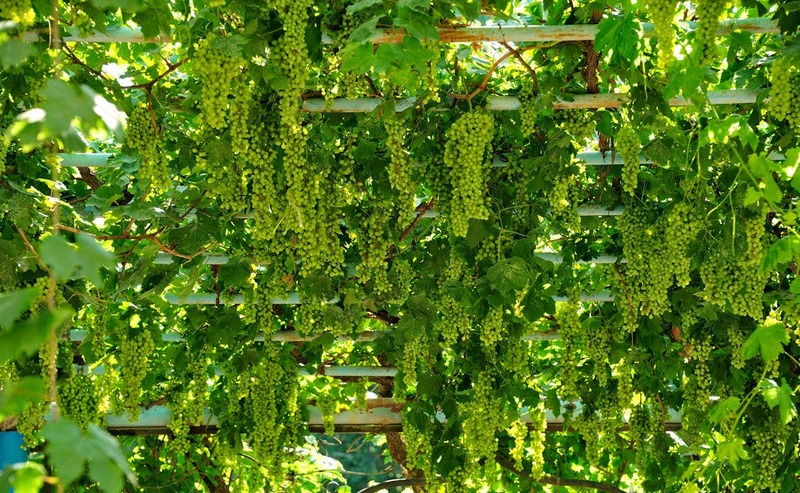 Since historical time onwards, the valley was cultivating seedless white grapes, the manaizi grape and the irrigation was done by using Karez underground irrigation system. 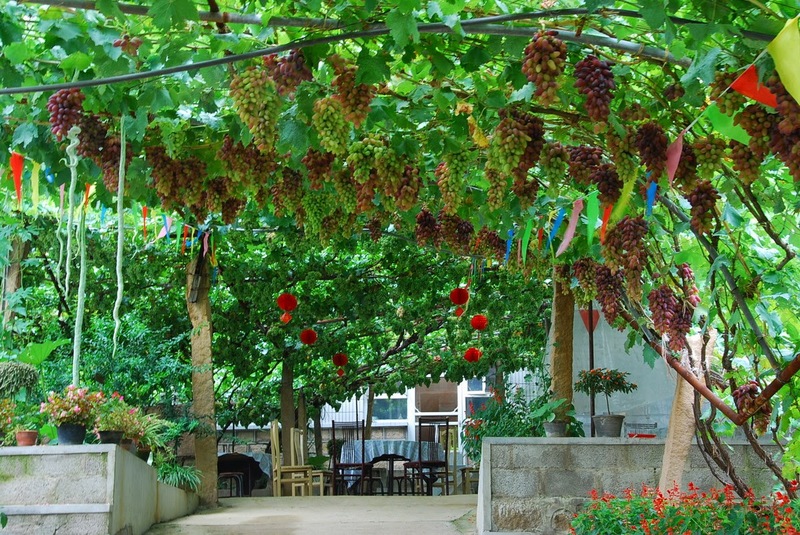 Grape Valley is a great tourist destination and you can get variety of dried fruits and Raisin from here. Where ever you look only grapes! The exact location Grape Valley is in the Flaming Mountain which is 13 kilometers far from Turpan city. Approximately 400 hectares of greenery is rich with grapes are cultivated by layer after layer. The valley of the mountain is full of grapes and also full of different fruits like, peaches, pears, apple etc. There are lots of drying houses to make the grapes in to raisins. The white seedless grape known as Wuhebai is the most sought after grape in the market which has 22% sugar content. Each grape is rich in flesh and water content. This may be due to the underground water irrigation system used by the farmers. Dense green trees made this valley as a world of green with brooks and sparkling irrigation system. The entire stretch of 15 kilometer is being irrigated with the underground watering system. The slope side of the mountain is full of mulberry, apricot, apple, fig, walnut, pomegranate, watermelons and muskmelons. Gaily dressed local girls with their wicker baskets carrying grapes, chatting, laughing moving around the valley add a romantic tune to the mood. In summer the valley will be an “Orchard of one hundred kinds of fruits” and in spring, it will be a “garden of one hundred flowers”. As per the available historical records, it says that grapes were introduced by Zhang Qian, who was on a diplomatic mission to the Western regions at the time of Western Han Dynasty. It is surprising scenario when looking from Flaming Hills toward Turpan, what you can see is only the barren red land and on the valley between the mountains you can see the rich field of grape wine yards. The farming is made possible due the underground irrigation system known as Karez. Legendary says that Karez systems are the life line of Turpan. 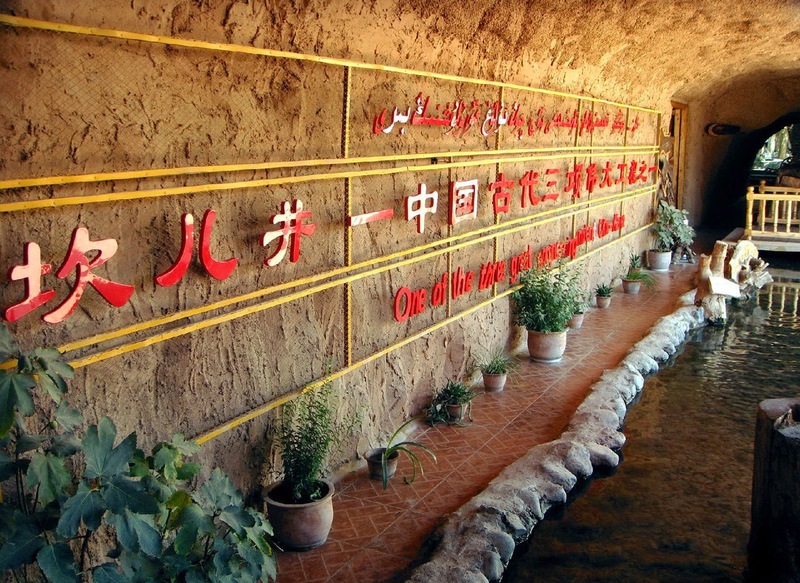 Without the irrigation system there would be no existence of Turpan and the grape wine yards. The Karez irrigation system implemented during 103 BC. 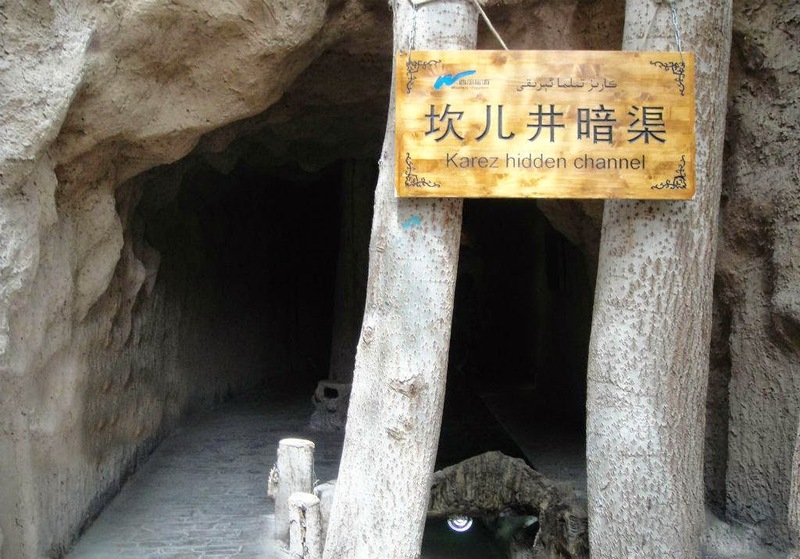 Though the Karez underground irrigation system can be seen Iran, the one what is employed at Turpan is the best and complete. In Turpan there are about 400 such systems are still in use. From tourist point of view this is one of the best places for relaxation. There are plenty of amusement park, tourist resorts and park. Also there are tourist villas, hotels and shopping centers. 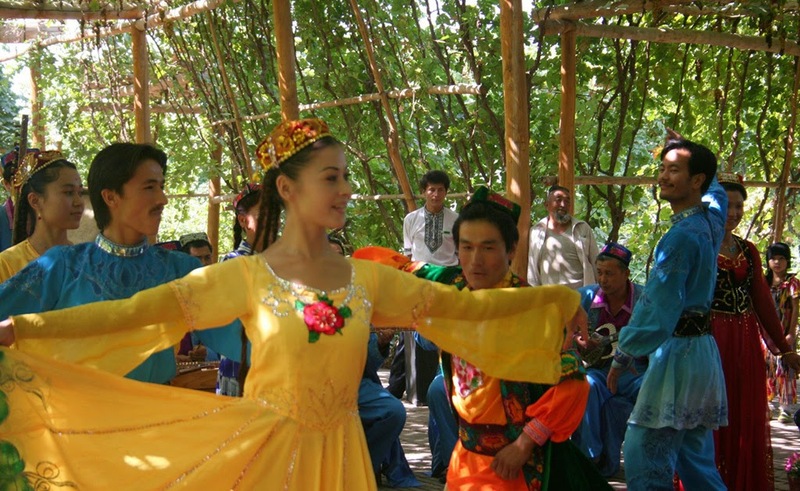 About 6,000 people are residing here comprising of Uygur, Hui and Han ethnic sections. Paying visit to Grape Valley will be a fascinating experience, the contrasting beauty of land and how people are making use of the maximum possibilities of irrigation; this will be an enduring memory.